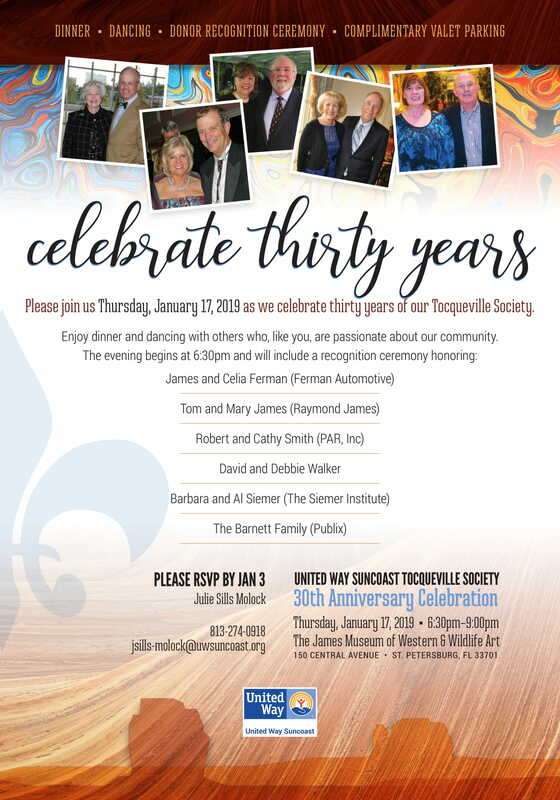 Please join us at The James Museum of Western & Wildlife Art in St. Petersburg on Thursday, January 17, 2019 as we celebrate the 30th Anniversary of the United Way Suncoast Tocqueville Society. In honor of this milestone anniversary, we invite you to enjoy dinner and dancing with others who, like you, are passionate about our community. Please RSVP by January 3rd to Julie Sills-Molock at jsills-molock@uwsuncoast.org. Your generous contribution to United Way as a member of the Tocqueville Society provides the building blocks for a self-sufficient life to those facing challenges in our community. Your leadership helps families access the resources they need most. To that end, we are pleased to induct six families into the United Way Worldwide Million Dollar Roundtable. This global membership group has 500 members. We currently have three Tampa Bay families as members of the Roundtable: John and Susan Sykes, Cy and Joanne Spurlino and Patricia Sullivan. The 2019 Honorees are: James and Celia Ferman; Tom and Mary James; Robert and Cathy Smith; David and Debbie Walker; Barbara and Al Siemer and Carol and Barney Barnett. Around the world, Tocqueville Societies have continued to see growth in a number of ways. Currently, 430 societies raise over $556 million dollars from nearly 27,000 individuals. Overall, United Way Worldwide raises nearly $5 billion dollars from close to 9 million generous donors.